On Feb. 12, 1984, Bruce McCandless ventured away unrestrained from the safety of his spaceship, which no previous astronaut had done. He could do it because of a brand-new, jet-powered backpack. 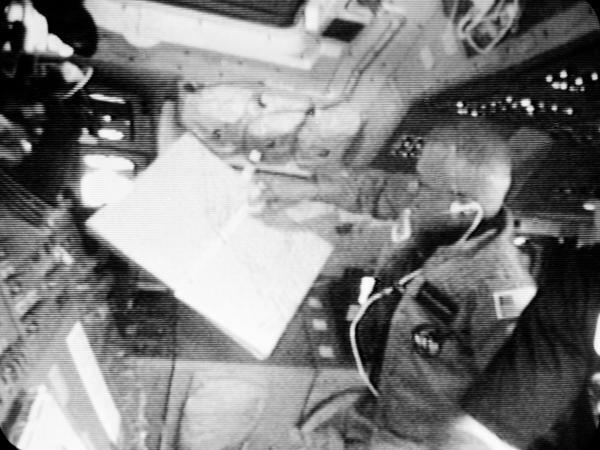 McCandless, mission specialist aboard the shuttle Challenger in February 1984, looks at a map showing the path of the spaceship. NASA astronaut Bruce McCandless has died at the age of 80, NASA announced Friday. You may not know his name, but you most likely have seen him in one of the most famous pictures ever taken in space. In 1984, McCandless strapped on a jet-powered backpack and flew away from the shuttle, by himself, untethered, with Earth as a backdrop. It was the first time an astronaut had ever floated freely in space; McCandless had helped develop the technology. McCandless had been an astronaut for a long time before he first flew in space aboard the shuttle. His was one of the voices that kept the first moon-landing crew in touch with mission control in 1969, telling Neil Armstrong, "There are a lot of us down here that would be willing to come along." While supporting other missions and waiting his turn, he helped design what became known as the MMU — the manned maneuvering unit. McCandless first went to space in 1984 aboard the shuttle Challenger and took these jet-powered backpacks along. During the mission, McCandless climbed into the 300-pound contraption and slowly eased out of the shuttle's cargo bay. This time, it was mission controllers on the ground saying to him, "You have a lot of envious people watching you. Looks like you're having a lot of fun up there." "My wife happened to be at mission control at the time and she says the laughter literally brought down the house. Which was sort of what I had intended because I wanted to loosen things up a little," he recalled. Relative to Earth, he was flying at almost 18,000 miles per hour. But relative to the shuttle, he was moving at a leisurely 1 foot per second. He said he wasn't nervous. He found it effortless. He had trained for that moment for years, ready for anything — the suit's nitrogen propulsion system failing or problems communicating with the shuttle. But what he wasn't prepared for was the temperature in the suit: "I got quite cold. My teeth were chattering. I was shivering," he said. The suit was designed so astronauts could work strenuously, but for that first six-hour test, he had moved little more than 300 feet away from the shuttle when the famous picture was taken, with Earth and space in the background. "I had the gold sun visor down. So that in principle, people could imagine themselves inside of there instead of me," he said. McCandless said he was most proud that, later in life, children came up to him to say they'd seen the picture. He hoped it would inspire the next generation of explorers. "I like to encourage folks to look at that and say, 'Well, I can do better than that.' "
NASA astronaut Bruce McCandless has died. You may not know his name, but you've probably seen him in one of the most famous pictures ever taken in space. In 1984, McCandless strapped on a jet-powered backpack and flew away from the shuttle by himself, untethered, with the Earth as a backdrop. It was the first time an astronaut ever floated free in space, and McCandless helped develop the technology. NPR's Russell Lewis has this remembrance of McCandless, who was 80 years old. RUSSELL LEWIS, BYLINE: Bruce McCandless had been an astronaut for a long time before he first flew in space aboard the shuttle. He was one of the ones who communicated with the crew of Apollo 11. Here's Neil Armstrong talking to McCandless as the spacecraft was about to enter lunar orbit during the first moon landing in 1969. NEIL ARMSTRONG: It's a view worth the price of the trip. 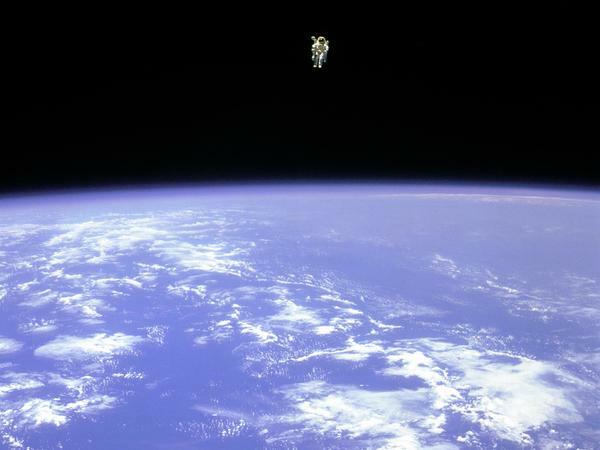 BRUCE MCCANDLESS: Well, there are a lot of us down here that would be willing to come along. LEWIS: While he was waiting his turn to fly in space, he helped design what became to be known as the MMU, the Manned Maneuvering Unit. LEWIS: McCandless first went to space in 1984 aboard the shuttle Challenger and took these jet-powered backpacks along. During the mission, McCandless climbed into the 300-pound contraption and slowly eased out of the shuttle's cargo bay as mission controllers looked on. UNIDENTIFIED MAN #2: You have a lot of envious people watching you. It looks like you're having a lot of fun up there. MCCANDLESS: Yeah, it's working very nicely. LEWIS: Neil Armstrong was on Bruce McCandless' mind when he took that first untethered foray into space. More than three decades later, he remembered precisely what he said. MCCANDLESS: But it's a heck of a big leap for me. UNIDENTIFIED MAN #3: Roger. Copy that, Bruce. LEWIS: During a 2016 NPR interview, McCandless recalled the tension associated with the spacewalk. He said he wanted to say something to put people at ease. MCCANDLESS: My wife happened to be in Mission Control at the time. And she says that it - the laughter literally brought down the house, which was sort of what I had intended. I wanted to loosen things up a little. LEWIS: It was nerve-wracking seeing McCandless out in space by himself. Relative to the Earth, he was flying almost 18,000 miles per hour. But relative to the shuttle, he was moving at a leisurely 1 foot per second. He says he wasn't nervous. He found it effortless. He had trained for that moment for years, ready for anything - if the suit's propulsion system failed or problems communicating with the shuttle. But what he wasn't prepared for was the temperature in the suit. MCCANDLESS: I got quite cold. My teeth were chattering. I was shivering. LEWIS: The suit was designed so astronauts could work strenuously, not simply flying like he did on that first six-hour test. By the end of that spacewalk he had moved a little more than 300 feet away from the shuttle when the famous picture was taken, him facing the orbiter with the Earth and space in the background. McCandless says part of the attraction is the image's anonymity. MCCANDLESS: I had the gold sun visor down so that in principle people can imagine themselves in there instead of me. LEWIS: McCandless said he was most proud that children came up to him later in life to say they'd seen the picture. He hoped it would inspire the next generation of explorers. MCCANDLESS: I like to encourage folks to look at that and say, well, I can do better than that. LEWIS: Bruce McCandless showed the way. He finished second in his class of 899 at the U.S. Naval Academy and used his engineering skills to make spaceflight safer. He once said the first untethered spacewalk was a mix of personal elation and professional pride. Russell Lewis, NPR News. (SOUNDBITE OF STEPHEN MCKEON'S "BING ABI") Transcript provided by NPR, Copyright NPR.